The nonprofit sector is in the midst of a major transformation in its approach to brand. The old nonprofit branding paradigm treated brand as a tool for fundraising. Brands were about building visibility and awareness among target audiences in order to drive financial support. Plain and simple. But today’s most innovative nonprofits are recognizing that this thinking is far too narrow. They’re moving to a new nonprofit branding paradigm that recognizes brand as a tool for driving internal cohesion and capacity, mission advancement and social impact. 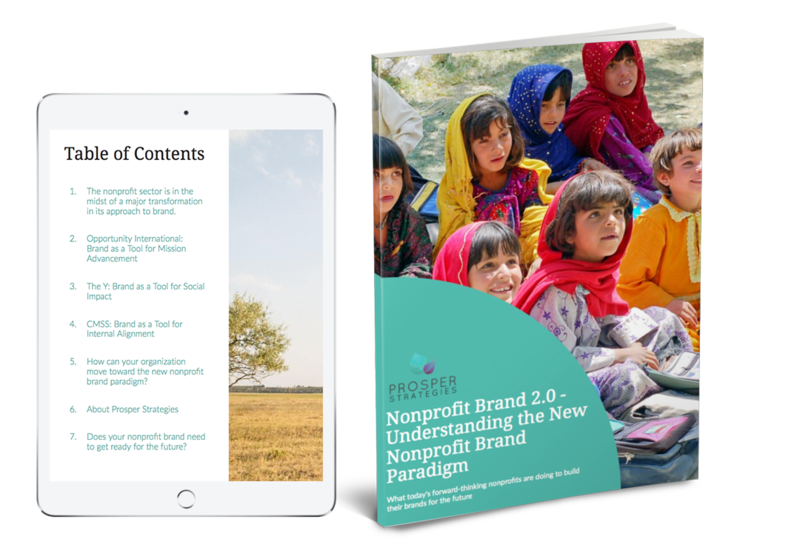 Download this ebook to learn what nonprofits like The Y and Opportunity International are doing to move toward the new nonprofit brand paradigm. Then, score your nonprofit brand on the Brand IDEA Framework to determine whether it's ready for the future. Where can I learn more about working with Prosper Strategies to move toward the new nonprofit brand paradigm? We view Changemaker Marketing Lab as a catalyst for Rebuilding Exchange to scale our reach and increase the impact of our message. This growth directly contributes to our ability to divert over 1 million pounds of materials from the landfill each year.